﻿In 2001, C. Brewer put all of its Hamakua Coast property on the seller’s block, including former Hakalau Plantation property. The land was snapped up, mostly by bulk buyers who began reselling it in smaller parcels. This land is the nexus for development. Future development of Hakalau is driven by the Hawai`i County General Plan, the Hamakua Community Development Plan, private developers, and the residents of the area. There are a variety of ways in which the public can provide input regarding development of Hakalau: Windward Planning Commission meetings, Hamakua Community Development Plan meetings, community discussions, petitions. Windward Planning Commission meetings are usually held the first Thursday of the month, starting at 9 a.m. at Aupuni Conference Center, 101 Pauahi Street, Hilo, Hawaii 96720. The March 7, 2019 meeting agenda includes no items within the Hakalau Kuleana, from the Kolekole River to the Poupou Stream at the 20 Mile Marker in Ninole. The County's existing General Plan was adopted in 2005, and a lot has happened on Hawai`i Island since then. Updating the General Plan is a comprehensive process that began in February 2015. Amendments were expected to be reviewed by the Planning Commission in late 2017/early 2018, and reviewed and adopted by the County Council thereafter. However, the process is running behind schedule and no amendments have been presented as of February 2019. More information about the General Plan and the current process for updating it can be found here. The 2005 General Plan established a process—the Community Development Plan (CDP) program—to translate island-wide goals and priorities put forth in the General Plan into action-items that could be executed on a district level. The General Plan provides the island-wide vision, so CDPs can stay focused on local policies that achieve the overall vision for Hawai‘i County. The Hāmākua CDP was adopted in August 2018 after NINE years of work by the Steering Committee and communities along the Hamakua Coast. NOW, it is essential to actively participate in the General Plan Update process given the fact that, if there is a conflict between the Hāmākua CDP and the General Plan, the General Plan will prevail. In January 2015, the Windward Planning Commission approved a Special Management Area Use Permit for the Shropshire Group, LLC, for a property located along Highway 19 fronting Mile Marker 19 at Waikaumalo. This development is called Ninole Sea Cliffs. ​Community concerns expressed prior to approval related to impact on the view plane, insufficient space between the highway and the cliffs, contamination from the former gas station/garage on the site, and cliff instability. Photo taken by private pilot-photographer on October 21, 2018. Toxic chemicals, particularly arsenic, were used extensively on sugar plantations. The former Hakalau Plantation pesticide mixing site on Hakalau Point contains significant concentrations of arsenic that require cleanup. 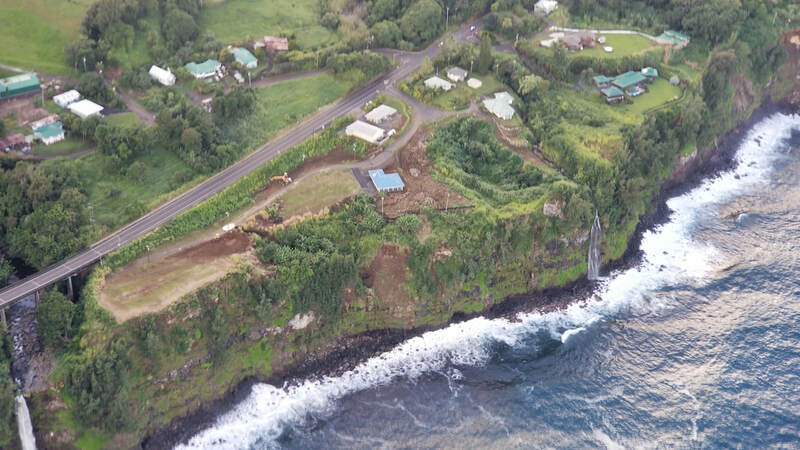 Cliffs along the Hamakua coast are subject to failure and pose a major challenge for development and major threat to the property owner and the natural environment.